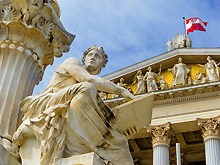 In January 2014 a new member firm in Austria joined the Tax Representative Alliance (TRA). Treuhand- und Revisionsgesellschaft m.b.H. joined the Tax Representative Alliance (TRA) as a new member in Austria in January 2014. Treuhand- und Revisionsgesellschaft m.b.H. was established in 1953 and is located in Vienna. In 1973 Heinz Manfreda became CEO and in 1991 his son Roland Manfreda joined the company. They and their staff provide a wide range of tax consulting services, e.g. accounting, payroll services, tax advisory, VAT representation, compilation of annual financial statements but they also offer professional business consultancy, controlling and auditing. The clients of Treuhand- und Revisionsgesellschaft m.b.H. are mainly small and medium sized companies in various industries.